The Texas Hill Country encompasses over 14,000 square miles of music, rolling hills, spring-fed rivers, and dude ranches. 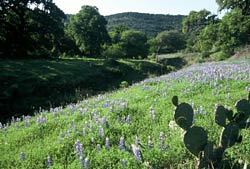 The Texas Hill Country’s diversity ensures that tourists can find virtually anything they want including lodging and vacation rentals when visiting. Close your eyes and imagine crystal clear streams a huge oak and cedar trees showered over the hills. In the spring, roadsides and open fields bloom with pride showing their wildflowers from the state flower of Texas, the bluebonnets, to the Indian Paint Brushes. In the spring, roadsides and open fields bloom with pride showing their wildflowers from the state flower of Texas, the bluebonnets, to the Indian Paint Brushes and many more. Summer is the time to tube down the river or boat on the many lakes or trying out some of the best barbecue joints you will find. Fall brings bright reds, oranges, and yellows to the landscape as leaves start to fall and announce the start of a new season. And finally, as winter settles in you’ll find mild weather and brisk cool air. Christmas is a whole season to itself, with the multitude of cities showcasing their decorative holiday lights throughout their charming towns. The Texas Hill Country residents have been known to greet their visitors with a friendly “Howdy ya’ll”. It’s a slice of heaven with breathtaking beauty and a relaxing atmosphere. You know how they say Texas is a whole other country? Well, the Hill Country is a whole other state. Five million travelers visit the state annually. Other wonderful sights include the abundant wildlife such as the white-tailed deer, armadillos and array of birds making their homes in the hills offers a unique glimpse at nature. Enticed to visit our beautiful state? We are excited to share what makes Texas so great! Find a Fredericksburg vacation rental today with Gastehaus Schmidt. Give us a call and we’ll help you find and select the perfect property for your getaway to the Texas Hill Country!